This article is about the mechanical device. For the Irish peerage, see Earl of Orrery. An orrery is a mechanical model of the Solar System that illustrates or predicts the relative positions and motions of the planets and moons, usually according to the heliocentric model. It may also represent the relative sizes of these bodies; but since accurate scaling is often not practical due to the actual large ratio differences, a subdued approximation may be used instead. Though the Greeks had working planetaria, the first orrery that was a planetarium of the modern era was produced in 1704, and one was presented to Charles Boyle, 4th Earl of Orrery – whence the name. They are typically driven by a clockwork mechanism with a globe representing the Sun at the centre, and with a planet at the end of each of the arms. 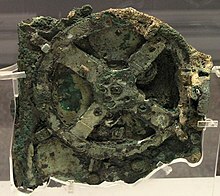 The Antikythera mechanism, discovered in 1900 in a wreck off the Greek island of Antikythera and extensively studied, exhibited the diurnal motions of the Sun, Moon, and the five known planets. It has been dated between 150 and 100 BC. The Antikythera hand driven mechanism is now considered one of the first orreries, but for many decades was ignored as it was thought to be far too complex to be genuine. It was geocentric and used as a mechanical calculator designed to calculate astronomical positions. According to Cicero, the Roman philosopher who was writing in the first century BC, Posidonius constructed a planetary model. In 1348, Giovanni Dondi built the first known clock driven mechanism which displays the ecliptical position of Moon, Sun, Mercury, Venus, Mars, Jupiter and Saturn according to the complicated Ptolemaic planetary theories. The clock itself is lost, but Dondi left a complete description of the astronomic gear trains of his clock. As late as 1650, P. Schirleus built a geocentric planetarium with the Sun as a planet, and with Mercury and Venus revolving around the Sun as its moons. In De revolutionibus orbium coelestium, published in Nuremberg in 1543, Nicolaus Copernicus challenged the Western teaching of a geocentric universe in which the Sun revolved daily around the Earth. He observed that some Greek philosophers had proposed a heliocentric universe. This simplified the apparent epicyclic motions of the planets, making it feasible to represent the planets' paths as simple circles. This could be modelled by the use of gears. Tycho Brahe's improved instruments made precise observations of the skies (1576–1601), and from these Johannes Kepler (1621) deduced that planets orbited the Sun in ellipses. In 1687 Isaac Newton explained the cause of elliptic motion in his theory of gravitation. Clock makers George Graham and Thomas Tompion built the first modern orrery around 1704 in England. Graham gave the first model, or its design, to the celebrated instrument maker John Rowley of London to make a copy for Prince Eugene of Savoy. 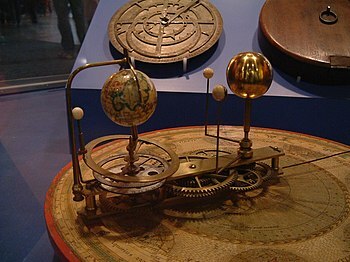 Rowley was commissioned to make another copy for his patron Charles Boyle, 4th Earl of Orrery, from which the device took its name in English. This model was presented to Charles' son John, later the 5th Earl of Cork and 5th Earl of Orrery. Independently, Christiaan Huygens published in 1703 details of a heliocentric planetary machine which he had built while resident in Paris between 1665 and 1681. He calculated the gear trains needed to represent a year of 365.242 days, and used that to produce the cycles of the principal planets. 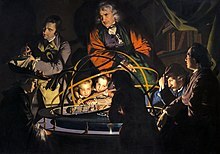 Joseph Wright's painting A Philosopher giving a Lecture on the Orrery in which a lamp is put in place of the Sun (ca. 1766), which hangs in Derby Museum and Art Gallery, depicts a group listening to a lecture by a natural philosopher. The Sun in a brass orrery provides the only light in the room. The orrery depicted in the painting has rings, which give it an appearance similar to that of an armillary sphere. The demonstration was thereby able to depict eclipses. That is, 0.4, 0.7, 1.0, 1.6, 2.8, 5.2 ... The numbers refer to astronomical units, the mean distance between Sun and Earth, which is 1.496 × 10⁸ km (93 × 10⁶ miles). The Derby Orrery does not show mean distance, but demonstrated the relative planetary movements. Eisinga's Planetarium was built from 1774 to 1781 by Eise Eisinga in his home in Franeker, in the Netherlands. It displays the planets across the width of a room's ceiling, and has been in operation almost continually since it was created. This orrery is a planetarium in both senses of the word: a complex machine showing planetary orbits, and a theatre for depicting the planets' movement. Eisinga house was bought by the Dutch Royal family who gave him a pension. All orreries are planetariums or planetaria (alternative plural). The term orrery has only existed since 1714. A grand orrery is one that includes the outer planets known at the time of its construction. The word planetarium has been captured, and now usually refers to hemispherical theatres in which images of the night sky are projected onto an overhead surface. Planetariums (orreries) can range widely in size from hand-held to room-sized. An orrery is used to demonstrate the motion of the planets, while a mechanical device used to predict eclipses and transits is called an astrarium. An orrery should properly include the Sun, the Earth and the Moon (plus optionally other planets). A model that only includes the Earth, the Moon, and the Sun is called a tellurion or tellurium, and one which only includes the Earth and the Moon is a lunarium. A jovilabe is a model of Jupiter and its moons. A planetarium will show the orbital period of each planet and the rotation rate, as shown in the table above. A tellurion will show the earth with the moon revolving around the Sun. It will use the angle of inclination of the equator from the table above to show how it rotates around its own axis. It will show the Earth's Moon, rotating around the Earth. A lunarium is designed to show the complex motions of the Moon as it revolves around the Earth. A normal mechanical clock could be used to produce an extremely simple orrery with the Sun in the centre, Earth on the minute hand and Jupiter on the hour hand; Earth would make 12 revolutions around the Sun for every 1 revolution of Jupiter. Jupiter's actual year is 11.86 Earth years long, so this particular example would lose accuracy rapidly. A real orrery would be more accurate and include more planets, and would perhaps make the planets rotate as well. Many planetariums (buildings) have a projection orrery, which projects onto the dome of the planetarium a Sun with either dots or small images of the planets. These usually are limited to the planets from Mercury to Saturn, although some include Uranus. The light sources for the planets are projected onto mirrors which are geared to a motor which drives the images on the dome. Typically the Earth will circle the Sun in one minute, while the other planets will complete an orbit in time periods proportional to their actual motion. Thus Venus, which takes 224.7 days to orbit the Sun, will take 37 seconds to complete an orbit on an orrery, and Jupiter will take 11 minutes, 52 seconds. Some planetariums have taken advantage of this to use orreries to simulate planets and their moons. Thus Mercury orbits the Sun in 0.24 of an Earth year, while Phobos and Deimos orbit Mars in a similar 4:1 time ratio. Planetarium operators wishing to show this have placed a red cap on the Sun (to make it resemble Mars) and turned off all the planets but Mercury and Earth. Similar tricks can be used to show Pluto and its five moons. An orrery made by Robert Brettell Bate, circa 1812. Now in Thinktank, Birmingham Science Museum. Shoemaker John Fulton of Fenwick, Ayrshire, built three between 1823 and 1833. The last is in Glasgow's Kelvingrove Art Gallery and Museum. The Franeker Planetarium built by a wool carder named Eise Eisinga in his own living room, in the small city of Franeker in Friesland, is in fact an orrery. It was constructed between 1774 and 1781. The "face" of the model looks down from the ceiling of a room, with most of the mechanical works in the space above the ceiling. It is driven by a pendulum clock, which has 9 weights or ponds. The planets move around the model in real time. An innovative concept is to have people play the role of the moving planets and other Solar System objects. Such a model, called a human orrery, has been laid out with precision at the Armagh Observatory. In the 2009 video game Ghostbusters: The Video Game, an orrery is used to align the dimensions of the "Ghost World" and the regular realm. An electric orrery can be found in the level Red's Laboratory in the game Spyro: A Hero's Tail. It is used to open doors that lead to other parts of the level, with a laser hitting switches above each door. In the 2010 Xbox 360 game Fable III, a magical orrery that, upon pulling a lever, transports the player to different celestial bodies within the Fable Universe's planetary system can be found behind one of Albion's Demon Doors. A large orrery is a key feature in the climactic scene of the film Lara Croft: Tomb Raider (2001). In the 2015 game Rise of the Tomb Raider, Lara traverses through the orrery of the legendary city of Kitezh while searching for the Divine Source. An orrery is used to determine when total eclipses occur in the film Pitch Black. The orrery is an artificial construct consisting of life-sized planets and a sun in Green Lantern: New Guardians. An orrery is among the scientific things Tarzan looks at in the 1999 film Tarzan. The third level of Fireproof Games' popular smartphone game The Room occurs in and around a Talisman Co. Heliocentric Orrery. An orrery is one of the rooms in Andrew Plotkin's interactive fiction game The Dreamhold. It contains multiple items vital to completing the game. An orrery can be seen on board the spaceship Juggernaut in the 2012 film Prometheus. A complex orrery is used in a pivotal scene of The Dark Crystal. In Prince of Persia: The Forgotten Sands, the Prince maneuvers through a gigantic water-powered orrery to get to the other side of one of the palace's towers; it is inaccurately named "the Astrolabe" in-game. The construction system Meccano is a popular tool for construction highly accurate orreries. Model 391, the first Meccano Orrery, was described in the June 1918 Meccano Manual. ^ a b Calvert, H. R. (1967). Astronomy: Globes Orreries and other Models. London: H.M.S.O. ASIN B001A9C9SQ. ^ King, Henry C.; Millburn, John R. (1978). Geared to the stars : the evolution of planetariums, orreries, and astronomical clocks. Toronto: University of Toronto Press. pp. 28–41. ISBN 0-8020-2312-6. ^ Lloyd, H. Alan (1958). Some Outstanding Clocks Over Seven Hundred Years. London: Leonard Hill Books Limited. pp. 9–24. ^ a b Brewster, David (1830). "Planetary Machines". The Edinburgh Encyclopedia. 16. Edinburgh: William Blackwood et al. p. 624. Retrieved 2011-06-08. ^ Lloyd, Alan (1958). Some Outstanding Clocks Over Seven Hundred Years. Leonard Hill Books Limited. pp. 46–57. ^ Poulle, Emmanuel; Sändig, Helmut; Schardin, Joachim; Hasselmeyer, Lothar (2008). Die Planetenlaufuhr : ein Meisterwerk der Astronomie und Technik der Renaissance geschaffen von Eberhard Baldewein 1563 - 1568 (1ª ed.). Stuttgart: Dt. Gesellschaft für Chronometrie. ISBN 978-3-89870-548-6. ^ Ronan, Colin (1992) [First published 1981]. The Practical Astronomer. London: Bloomsbury Books. pp. 108–112. ISBN 1-85471-047-8. ^ Carlisle, Rodney (2004). Scientific American Inventions and Discoveries, p. 189. John Wiley & Songs, Inc., New Jersey. ISBN 0-471-24410-4. ^ "Revolutionary Players". Search.revolutionaryplayers.org.uk. Archived from the original on 2011-07-24. Retrieved 2010-02-09. ^ "Welcome - Planetarium Friesland". www.planetarium-friesland.nl. ^ Pentz, M.J. (1971). The Earth, Its Shape, Internal Structure and Composition. OU_S100_22. Bletchley: Open University Press. ISBN 978-0-335-02034-8. ^ "Adler Planetarium:Research Collections". 1300 South Lake Shore Drive • Chicago IL 60605: Adler Planetarium. 2010. Archived from the original on 27 January 2012. Retrieved 22 June 2011. ^ a b "Armagh Observatory Human Orrery". ^ "Sky's the Limit Observatory and Nature Center Human Orrery". ^ Sixma, H (November 1934). "The Franeker Planetarium". Popular Astronomy. SAO/NASA ADS. XLII (9): 489–495. Bibcode:1934PA.....42..489S. Retrieved 2011-06-22. ^ Bramwell, Tom (April 19, 2006). "Oblivion PC Orrery available". Eurogamer. Retrieved February 25, 2019. ^ "Model 391, Meccano Orrery". ^ Whiting, Michael (2007). "Orrery Developments:The Use of Meccano in Constructing Planetaria". Bulletin of the Scientific Society (94). Retrieved 2017-05-03. Wikimedia Commons has media related to Orreries.